Why not get people to pay for the health care their behaviour will require? By now you’ve probably heard that eating too much red and processed meat is bad for you. Not only is it associated with increased rates of coronary heart disease, stroke, and type 2 diabetes, but there is also convincing evidence that red and processed meat can cause cancer . The WHO also classifies red meat as probably carcinogenic – even if eaten unprocessed. There is strong mechanistic evidence for an association between eating red meat and colorectal cancer, and there is also evidence of links with pancreatic cancer and prostate cancer. Given the negative health impacts, there have been calls for certain types of meat to be regulated similar to other carcinogens – such as tobacco or asbestos – or like other foods of public health concern – such as sugary drinks. Like taxes on other products that can harm health, a health tax on red and processed meat could encourage consumers to make healthier choices. And our new research, which looks at the benefits of a health tax on red and processed meat has found that such as tax could prevent more than 220,000 deaths and save over US$40 billion globally in healthcare costs every year. In our new study, colleagues from the International Food Policy Research Institute in the US, and the Oxford Martin School and the Nuffield Department of Population Health at the University of Oxford in the UK, analysed the impact of regulating red and processed meat consumption through a health tax on meat. We calculated so-called optimal tax levels that would account for the health costs of red and processed meat in close to 150 countries and regions around the world. So although consumers would still have the choice to eat red and processed meat, they would have to contribute to paying for treating the chronic diseases that its consumption is assumed to cause. For our study, we used estimates of how red meat and processed meat affect the risks of chronic diseases, and how much it costs to treat those. We then calculated the health and economic burden associated with one additional portion of red and processed meat, and based on that, we estimated the health taxes per portion of red and processed meat that would account for those costs. 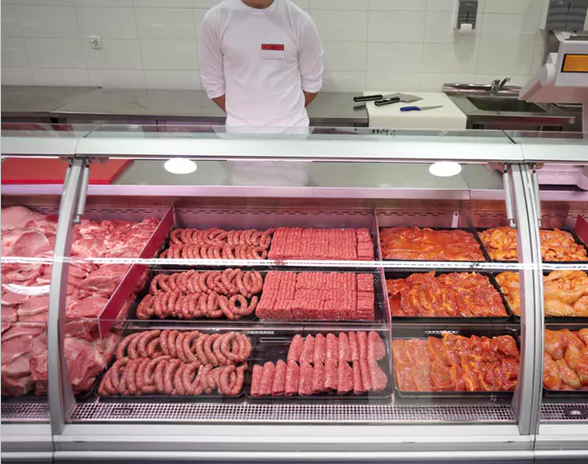 We estimated that in 2020, there will be 2.4 million deaths attributable to red and processed meat consumption globally, as well as $285 billion in costs related to healthcare. High-income countries, such as the UK and the US consume about double the global average of red and processed meat. These countries also spend more money treating the associated chronic diseases. Low-income countries consume less than half the global average and also spend less money treating meat-related diseases. Because of this difference in health costs, the health taxes would need to differ by region, to factor in the health and economic burden of red and processed meat consumption in a specific region. And as a result, the health taxes we calculated are based on an economically optimal tax that is high in high-income countries and low in low-income countries. The health taxes on sausages in Germany, and bacon in the US, for example would increase prices by a whopping 160 per cent. Whereas prices for processed meat in China would have to increase by 40 per cent, and those in Ethiopia by less than 1 per cent. Due to its relatively modest healthcare spending the UK is somewhere in the middle with an 80 per cent increase. The higher prices on red and processed meat encourage dietary shifts to other, less harmful foods. Our results suggest that if the health taxes were introduced, consumption of processed meat would decline by about two portions per week in high-income countries and by 16 per cent globally. Lower consumption of red and processed meat would lead to 220,000 less deaths a year from chronic disease – such as coronary heart disease, stroke, cancer, and type 2 diabetes. It could also have positive knock-on effects on climate change and body weight. We found that it could reduce global greenhouse gas emissions by over a hundred million tonnes – mainly due to lower beef consumption. And it would also reduce levels of obesity by driving consumers to lower-calorie substitutions. Tax revenues would amount to $172 billion globally and cover 70 per cent of the health costs that red and processed meat consumption puts on society. To fully cover the costs, the health taxes would have to be doubled and, in high-income countries, increase to 200 per cent for processed meat. Our findings make it clear that the consumption of red and processed meat has a cost – not just to people’s health and to the planet – but also to healthcare systems and the economy. Governments don’t need to tell people what they can and can’t eat, but they have a responsibility to encourage the adoption of healthy and sustainable diets. And making sure the health costs of foods are reflected in their prices is an important component of that.